Purchasing this item will earn you 94 reward points (Love Point(s) $94.00) ! 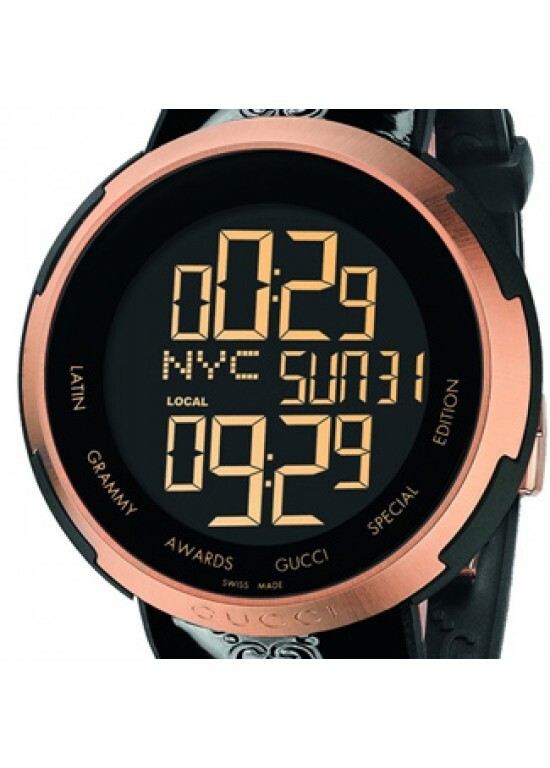 Gucci chic and elegant Gucci I-Gucci Stainless Steel Rose Gold PVD Unisex Watch - YA114102 is a fashion “wow” statement. This elegant and beautiful watch is easily dressed up or worn casually. This beautiful Round Stainless Steel Rose Gold PVD case has a 44mm case diameter. This timepiece also has Quartz movement. This Digital Black dial features. A Sapphire Scratch-Resistant crystal protects this beautiful Gucci timepiece and the bezel material is Fixed Rose Gold PVD. The bracelet of this Gucci I-Gucci is made of Black Rubber Guccissima. The watch clasp type is Deployment.